This work presents a novel approach for cathodically polarized TiO2 nanotube electrodes in electrochemical advanced oxidation processes generating sulfate radicals. Although TiO2 do not offer electrochemical response at the anodic region in the dark, its simple self-doping can enable oxidation capacity. Cathodically polarized TiO2 electrode (CP-TNT) was applied in the electrolysis of p-nitrosodimethylaniline dye in sulfate and nitrate aqueous electrolytes, showing much better decolorization efficiency in the presence of sulfate ions. Another evidence of SO4•− generation was the detection of persulfate ions (SO4•− + SO4•− → S2O82−) formed during bulk electrolysis of a sulfate aqueous solution (38 μmol L−1 S2O82− after 30 min). 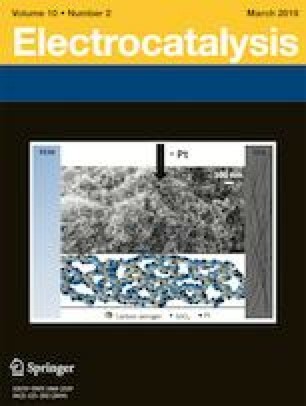 These results open the way for application of CP-TNT electrodes in EAOPs as an alternative for highly cost anodes for electrochemical generation of active sulfate species for degradation of organic contaminants. The authors are grateful to the Brazilian Research Agencies: Coordenação de Aperfeiçoamento de Pessoal de Nível Superior (CAPES)—Finance Code 001; FAPESP (grant numbers 2014/50945-4, 2013/16930-7) and CNPq (grant number 428014/2018-6) for the financial support.